This idiom indicates gullibility. You use it in good humor after someone mistakenly places his trust in someone he shouldn’t have or should have known something since it is common knowledge. You can sign it about yourself or about another person. When you sign it, widen your eyes as if to show embarrassment due to the gullibility. You don’t normally direct this lighthearted idiom toward yourself but rather toward someone else. You often use this sign, which can be compared to the English idiom “missed the boat,” when someone tells a joke and everyone laughs except one person, or when one person wants something repeated that everyone else understood the first time. In these moments, someone will look at the person who doesn’t get it, smile, and sign train gone. The facial expression for this sign can be puffed cheeks (imitating a smokestack) or just a blank stare, whichever you prefer. Either way, everyone will know that someone didn’t catch the information. Hearing people use this idiom as well, and just as in English, you shouldn’t use this idiom very often because it’s not polite. In fact, it’s somewhat offensive, although perhaps in a group of good friends you can get away with it if you mean it in good fun. The facial expression that accompanies this sign determines the degree of meaning or, in this case, maybe the size of one’s brain! Sticking out your flattened tongue while signing pea brain makes your meaning pretty clear. What’s even meaner is crossing your eyes while showing the sign. So as a general rule, save this sign for people you know really well. You can also direct this sign at yourself in a self-deprecating manner when you do something stupid or state something that’s obvious to everyone else. If you’ve ever experienced a situation in which something doesn’t go as expected, you probably already know how to use this expression. 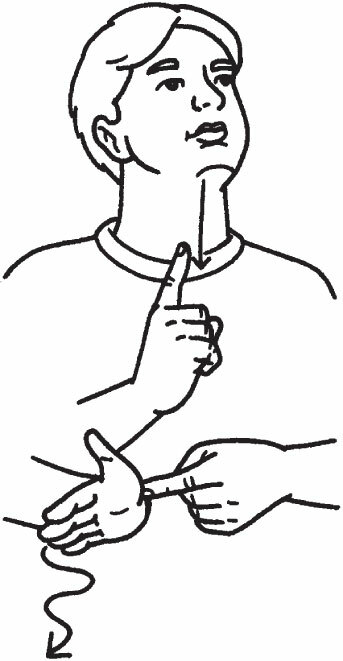 Like the illustration indicates, you open your passive hand facing up. Using your dominant hand, you start with the manual number 5 and, with the manual letter S, you act like you’re catching a fly in the palm of your hand. This expression is used in English as well as Sign. In English, you use this expression only after someone asks a question. 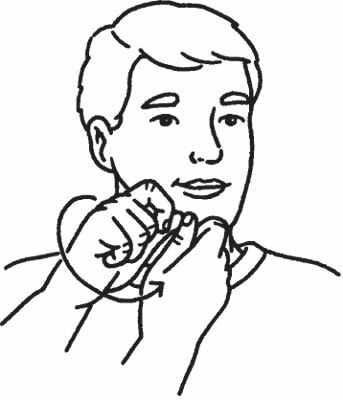 However, in Sign, you can ask a question and use this expression at the same time. A good facial expression to go with this sign is to smirk (smiling with just the corner of your mouth) and raise your eyebrows. Another way to emphasize this expression is to make the size of the sign bigger. Doing so tells whomever you’re signing that you really don’t have any idea whatsoever. This expression is also used in English as well as Sign. You can sign it in two different ways; both signs have pretty much the same meaning. 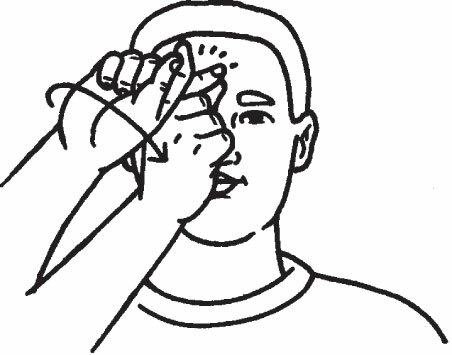 The first sign, shown in the picture, is made by placing your index finger and thumb on your cheek and twisting your wrist in an inward motion. The facial expression can be a smile or pursed lips — as long as your attitude is positive, the facial expression will follow. 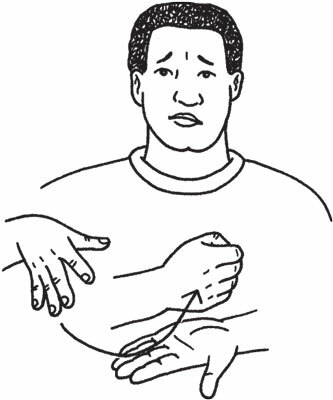 The second sign is made by putting your thumb on the center of your chest and wiggling the fingers, leaving your facial expression fully visible. Forming an “ooh” shape with your mouth means really cool. Opening your mouth wide can mean a surprised cool. 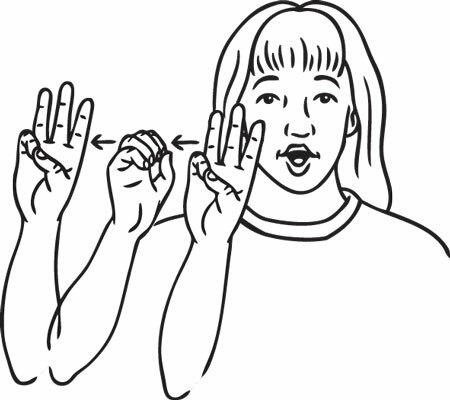 You will see Deaf people using both signs interchangeably. 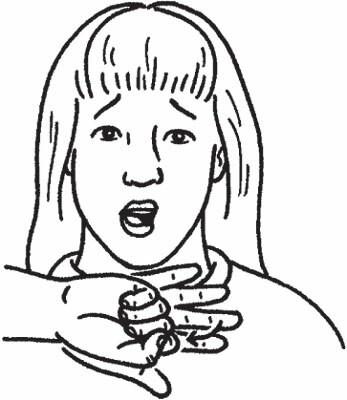 Make this sign when you witness an embarrassing action or are explaining one of your own embarrassing actions to someone. Open your eyes wide; you can even put on a nervous smile as you express this sign. 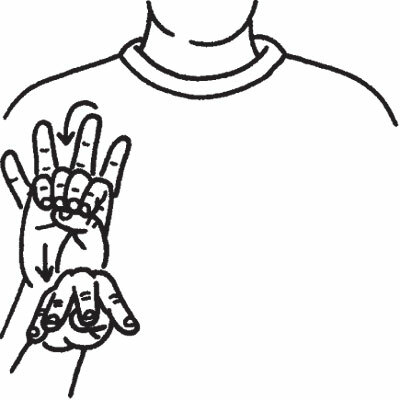 You make this sign with the manual 5 palm facing the signer and close it to make the manual S; it signifies a lump in your throat. By making this sign, you’re saying that someone is ultraconservative, close-minded, or just an old-fashioned square. For your facial expression, press your lips tightly together, perhaps paired with a snobbish-type expression. You can use this expression with a positive or a negative connotation. Your facial expression, along with the conversation’s context, tells your friends exactly how you feel about the subject at hand. Your eyes should be wide open, accompanied by a partial smile. 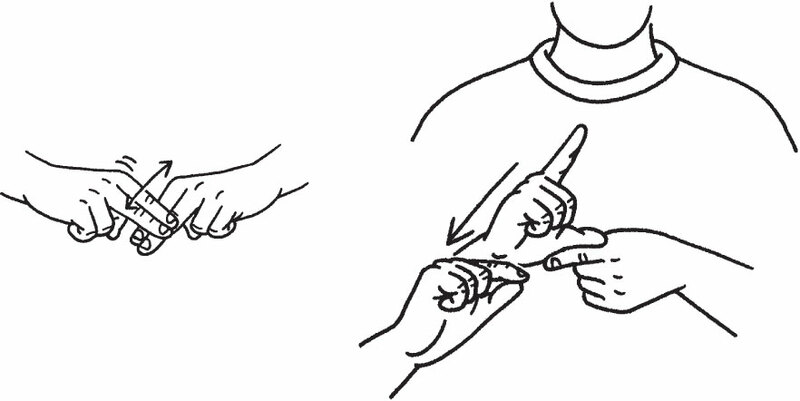 You fingerspell W-O-W right next to the side of your open mouth. If your response is less than favorable, you crunch up your eyebrows.